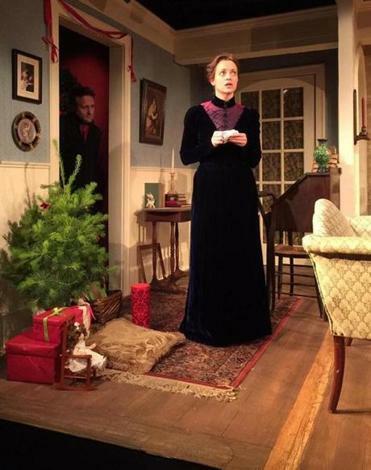 Robert Kropf and Stacy Fischer star in “A Doll’s House” at Harbor Stage. Wellfleet — Let’s be honest: Most Noras are annoying. After spending two acts manipulating everyone in her orbit, Ibsen’s heroine — on the surface, a scheming flibbertigibbet — gets all righteous and tells off her condescending spouse before stomping out in a fit of righteous rage. Stacy Fischer brings so much more to the role — infinite shadings, in a sensitive adaptation by director/castmate Robert Kropf. Kropf plays Nora’s nemesis, the disgraced lawyer Krogstad, with a slightly Aspergian affect: all innocent compulsive blinking as he puts the screws to her over a fraudulent loan. “A Doll’s House,” prescient for its day (1879), is so frequently revived, surely no synopsis is necessary, but briefly: Years ago, Nora Helmer, fearing that her husband’s nervous breakdown was life-threatening, secretly took out a promissory note to fund a restorative sojourn in southern Italy. (Was she treating herself as well, and seeking justification? That much seems implicit.) Now, through household economies, she has nearly paid off the debt; however, Krogstad — with an ex-attorney’s eye for the inculpatory detail — has detected a discrepancy that could spell her ruin. He has no intention of cutting her some slack, as long as she’s in a position to aid his quest to regain respectability. Ibsen put the machinations in motion, and Kropf has stripped away the Victorian fustiness of translations past to lay bare a conflict relevant to our overextended, consumerist era. The staging — set and costuming — remain period for the most part (there’s one lamentable lapse in the final scene), but the timeless psychological underpinnings emerge in sharp relief. Nora’s infantilization is less irritating than usual because Fischer embarks on the role with what appears to be a genuine, irrepressible exuberance, gradually eroded during her trial by truth-telling. As Kristine, a newly resurfaced childhood chum, Brenda Withers conveys the straitlaced culture of sacrifice that women of her place and time were expected to maintain: She’s tremulous, easily startled (Kropf’s script is sprinkled with premonitory, pre-slam outbursts), and understandably drawn to this more confident, colorful specimen. As Dr. Rank, the family friend who is likewise smitten with Nora, Robin Bloodworth makes the halest invalid you’re ever likely to see — but so deeply embodied are his emotions, surfaces cease to matter. Rounding out the cast (Kropf has dispensed with assorted superfluous servants, as well as the Helmers’ three young children, alluded to but here neither heard nor seen) is Jonathan Fielding as Mr. Helmer, who keeps his paternalism within acceptable bounds, almost palatable, until the penultimate showdown. Every small detail in this production bespeaks a profound understanding of the play’s core: the various Madonna and Child artworks that decorate the Helmers’ abode, the way Fischer lingers over the “m” of “money” (at the prospect of an uptick in income), the interpolation of horror-movie-style interludes of discordant piano and violin. This is Kropf’s fourth adaptation of a classic for the company to date (an anthology really is in order), and I can’t wait to see what he dusts off next. Set, Sarah C. Walsh. Lights, John R. Malinowski. Costumes, Emily Taradash.